With the second half of the NBA underway, and the most wide open season we have had in years (and all the contenders stocking up on players like an arms race between warring countries), let’s have a quick rundown on some of the stories from the 1st half of the NBA season. Who’s the 1st Half MVP? 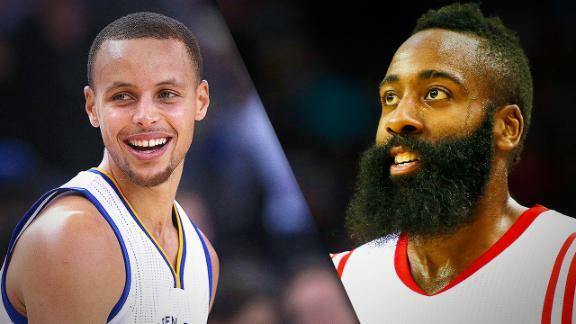 I’m sure there will be some candidates rising in the second half of the season (LeBron James, Kevin Durant, Marc Gasol, John Wall, Russell Westbrook, etc), but it’ll be hard pressed to surpass anything that James Harden and Steph Curry have been doing this season, especially if they continue to play like this. Harden, in fact, has put the team on his back (27.4 PPG/5.7 RBG/6.8 ASG/2 SPG/45% FG/87% FT/38% 3P), taking whatever spare part of the alpha dog mantle that Dwight Howard had, and has carried the Rockets all season & kept them high in the pecking order of the Western Conference. He deserves to be saluted to be honest, he’s basically been unstoppable. You know who’s been slightly more unstoppable this season? Stephen Curry. When he first became known at Davidson during his freshman year, his shooting exploits were beyond explanation. By the time he was a Junior, he was easily one of the best players in the country despite his slight build and small school pedigree. In fact, I used to argue with one of my friends (I won’t name said friend here….. but Marco was that guy. Ok, sorry Marco. Actually, I’m not that sorry…) about his NBA potential. I always believed he’d be able to hang in the pros, because if all else fails, he can live off of being a deadly spot up shooter. Secretly, though, the way he used to get his shot off & set his defenders up to create space, I would hope he’d be better than that. I never thought I’d see what I’m seeing from him now. He’s treating the league like it’s his little brother. He’s somehow mixed the best parts of Steve Nash & Allen Iverson’s game & combined it with his. It’s become comical how well he can shoot from anywhere & under any scenario (23.6 PPG, 48% FG/90% FT/40% 3P), how his handles have become Isaiah Thomas-esque, how he’s reduced b-ball fans into giggling schoolgirls whenever they watch him, & how he’s turned Golden St to not only the best team in the West right now, but also the most entertaining team in the NBA. I want to go back to his ball handling for a second. When it comes to basketball, my belief is that having great handles is like having a universal master key that allows you to open any door. It creates opportunities to set your defender up to better control the game. Curry has improved that part of his game so much in the last couple of years, that it has now become as lethal as his jumper, and that alone makes him completely dangerous. It’s allowed him to become one of the best slashers in the NBA as well as one of its best passers and creators (8 assists per), and it also provides him with supreme confidence that the entire Warrior team feeds off of. There is nothing in the NBA right now, as enticing as watching Curry get hot (no pun intended) during a game. When he gets going, Twitter blows up, Vines start popping up from everywhere, & if you’re included in some chat groups on your phone, then it starts vibrating like crazy. The greatest part of Klay Thompson’s 37-point 3rd quarter vs. the Kings (on his way to a 50-point night) outside of the fact that you couldn’t believe what you were watching, to me was being slightly surprised that it actually wasn’t Steph doing this first. Meanwhile he was laughing almost in hysterics at what was happening as well, enjoying the moment as much as any Warrior fan in the building. About two weeks later, he dropped 51 on the Mavericks scoring 26 of his own in the 3rd quarter. The way this season has been going for Curry so far, that honestly sounds about right. Will Kevin Love stay with the Cavaliers? I can’t see how. You have to think about it in these terms for a second. In last year’s All Star game, he started for the West. In this year’s All Star game, he didn’t even make the team…..for the East. That alone has probably made him second guess this move to Cleveland if he hasn’t already, despite what he says publicly. After watching his franchise fail time & time again to put him in a position to win in Minnesota (which included the screw up of only offering him 4-year extension instead of the 5-year franchise max offer), Love wanted to be part of a winning culture. So getting traded to Cleveland where LeBron James and Kyrie Irving was a win in his case. I’m positive he knew he was going to sacrifice certain parts of his game to make this work, but I’m sure he wasn’t expecting this. He’s become a 3rd option on offense, someone who spends more time spotting up for jumpers and threes, than controlling the boards & the paint…. you know, something he’s getting paid almost $16M this season to do. His stats have come down pretty much across the board which is expected (Last season: 26.1 PPG/12.5 RBG, 3 offensive/46% FG/37.6 3P; This season: 17 PPG / 10.4 RBG, 2 offensive/43% FG/34% 3P), however with the trade of J.R. Smith, it’s not surprising to see him with the 4th most shot attempts on the Cavs most nights now, which I guarantee he did not sign up for. Then he has to hear his coach David Blatt state the he is not a max player (though he predictably backtracked afterwards) & then LeBron calling him out on Twitter in a passive aggressive manner (which he also backtracked, then admitted the Twitter comment, to only moonwalk again). Where it becomes sticky is that despite his struggles, this is the best team he’s even been on by far who’s gotten hot over the last month (won 14 of its last 16), so it’s hard for him to complain when his team has been winning. But obviously things are not going well for him this season so far, so he has to hope things get better sooner than later. If not, he’ll have to look at his options. I think the only way he stays in Cleveland is if he opts into his contract for next season, & tests the market in 2016 when the cap will skyrocket. The problem is, if he continues to go up & down in play until then, will it take enough of a hit to his value that he won’t get the max? K-Love’s got a lot to consider in the upcoming months. You can consider a few, but for me this season, it’s definitely Charlotte and Denver. After the way the Hornets played this season, I assumed they would build on that success while adding Lance Stephenson to the mix. This season however, has been marred with injuries, Lance has been inconsistent and him & Hornets coach Steve Clifford has not seen eye to eye in philosophies, rookies Noah Vonleah and P.J. Hairston has been coming along extremely slowly this year having little to no impact whatsoever. As far as Denver is concerned, when a coach from a professional NBA team has to try banning his team of NBA professional players from cell phone use in team meetings, pretty much says in all. Kenneth Faried — after a huge performance in the World Championships this summer & $50M contract extension — has stayed pretty stagnant. Danilo Gallanari seems like he’s still recovering from his knee surgeries, they played with an overall flair of indifference, as of yesterday, started the process of cleaning house (although most teams are probably upset they didn’t get Wilson Chandler before the trade deadline) & at this point, it seems like the team has pretty much quit on Brian Shaw and vice versa. I’d be surprised if Shaw comes back to coach the team next season. Atlanta – Barring a major collapse, I can’t see them losing a 6.5 game lead over the conference. Huge game tonight vs. Toronto. Chicago – Getting healthier. Week off is especially huge for Joakim Noah and Derrick Rose to recover from their knee issues. Toronto – Should solidify the 3rd seed at the very least with one of the easiest schedules remaining in the NBA. Cleveland – Team LeBron is rounding into form. Next step: Showing Kevin more Love. Washington – If I’m correct, a potential 1st round series vs. Cleveland will be one of the most intense playoff series in a couple of months. Milwaukee – Getting Coach Kidd to mold MCW will be one of the most underrated things to watch. I like what the Bucks are building so far. Miami – I would actually rank Miami higher (especially after acquiring Goran Dragic yesterday), but everything hinges on Chris Bosh’s health right now. If lost for the season (blood clot in his lung), Miami stays where they are. Detroit – I almost….ALMOST put Brooklyn in this spot, but adding Reggie Jackson yesterday is a slightly bigger upgrade for Detroit than it is for Brooklyn scooping up Thaddeus Young. Have a feeling this will go down to the wire. Golden St. – This might be the strongest a conference has been in my lifetime. The 8th seed could beat the top seed and no one will bat an eye. Anyway, they’ll hold onto the top spot. Memphis – Picking up Jeff Green fills the one flaw this team had (athletic wing that can score on his own). This might be the best team in the West when it’s all said and done. San Antonio – Now that everyone is healthy, I can see them going on a late run. Gregg Popovich says everything hinges on Tony Parker to repeat. 21-3-13 with 0 TOs (in a loss to the Clippers last night)? I’d say he’s off to a good start so far. Portland – Threw themselves in the Western Conference arms race by scopping Aaron Afflalo to make their bench that much deeper. Houston – Shhh! Don’t make any sudden movements…. but Josh Smith is playing better these last three weeks. Could be a huge lift for the Rockets (& my fantasy team) if he stays this consistent. L.A. Clippers – DeAndre Jordan is playing like a grown man, especially since Blake went down. Bench isn’t strong enough to win the title this year. Dallas – I’m personally rooting for Amare to be healthy for the rest of the season at least & give us old Amare for 3 months. Wishful thinking I know. But solid pickup nonetheless. Oklahoma City – Potentially the scariest 8th seed in NBA history… that also got stronger by adding Enes Kanter, Kyle Singler, & D.J. Augustin to the mix. Bonus question: Will the population increase in Toronto in December 2016? ….well you get the point. At the end of the seminar you have to get a #THOTSZN tattoo on your lower back to prove that you really are about that life. I’m not sure this city is quite ready for all the black celebs that will import themselves into Toronto for that week, & I’m not quite sure the black celebs understand just how “nice” these Canadian groupies are willing to be. Either way, it’ll be interesting to see these worlds collide north of the border. I just can’t wait to watch! Seriously speaking, I have been speaking about having the All Star game here for at least 15-20 years, ever since the Raptors were still playing at the Skydome. Previously, when the NBA had their expansion team run in the early 90s (Miami, Orlando, Minnesota, & Charlotte), that city usually got to host an all star game within the first five years of existence. So when Toronto & Vancouver had their turn, I was certain the Raps would get one. No way did I think it would come 20 years later. So now that it’s less than a year away, it will be wonderful for Toronto to be able to celebrate (as well as Canada) it’s own underrated history with this sport. With the direction of where the Raptors are headed these days, & what Drake and his OVO team will have planned for the weekend, as well as all the major festivities, I’m sure it’ll be a incredible experience. Can’t wait…. This entry was posted in Basketball and tagged Basketball, Charlotte Hornets, Denver Nuggets, James Harden, Kevin Love, NBA, NBA All Star Game, Steph Curry, Toronto, Toronto Raptors on February 20, 2015 by Cal Cee.